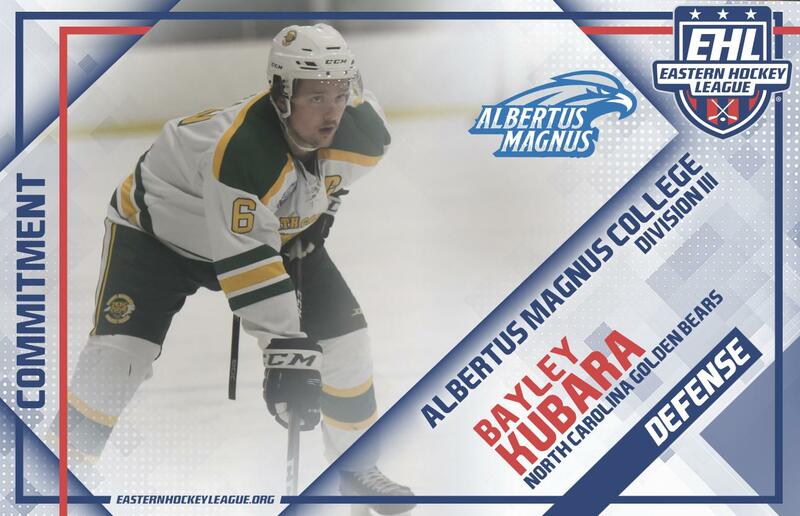 GARNER, NC -- Bayley Kubara, a defenseman for the North Carolina Golden Bears, has committed to Albertus Magnus College for the fall of 2019. The 6'2 native of Australia is in his third full season of junior hockey, and second year in the Eastern Hockey League (EHL). Known more for his size and physical style of play, Kubara has tallied 21 points in 63 career games in the EHL. “You could always count on him to be steady and calm no matter what the situation," said Golden Bears head coach Brent Selman. "He was the perfect leadership for the young club." Selman uses the word 'was' because the veteran defenseman was traded this week to the Seahawks Hockey Club, to help bolster their defensive core ahead of the EHL Playoffs. Kubara will get an instant feeling of comfort when he joins the Seahawks, as he's already close friends with fellow Australian Jeremy Vasquez. However, Kubara knows his next step following this season is due in large part to his time with the Golden Bears. This fall, the Falcons will be kicking off their inaugural season at the Division III level. To date, Kubara and eight other EHL players have committed to the new program, as they will look to lay a strong foundation in the very first year. Learn more about the North Carolina Golden Bears on the team's official website, and check out the full 2018-19 NCAA commitment list.